GREENSBORO – The average person does not begin a new career in their 60s. Then again, Hilda Coleman is no ordinary person. Coleman, 76, was named McDonald’s Crew Person of the Year for the Triad Co-Op for calendar year 2017 for the way she greets customers patronizing the Albert Pick Road store in Greensboro. She began her new career in the fast-food industry more than a decade ago. The award helped her reminisce of those early days beginning in 2007. Hilda Coleman was named McDonald’s Crew Person of the Year for the Triad Co-Op for calendar year 2017. Coleman, 76, a native of Colfax who lives in Stokesdale, works at the Albert Pick Road store located off N.C. 68 in Greensboro. She is pictured by a vase of yellow and red flowers Coleman is responsible for maintaining each morning. The colors have personal meaning for Coleman. It was nothing for Coleman, born in 1941 to Mary Lou Noah Atkins and Willie Dale Atkins, and her nine brothers and sisters to work under a sweltering sun while helping their parents managed a farm that offered tobacco, corn, what, watermelons, tomatoes and cantaloupes. Even on the hottest days as a child, “we still had our work to do,” Coleman recalled. In other words, working by the fryers inside an air-conditioned building was hardly a challenge. Once she retired in January 2005 from Gilbarco, however, Coleman never planned on going back to work. But life had something else in mind. Her husband, who was also retired, suffered a fatal heart attack on April 29, 2005. With the family still depending on her, she filled out an application at the newly opened store in Oak Ridge. When she began, there was an adjustment – but mostly on the part of her co-workers. Part of Coleman’s job now is to take care of the lobby area. That includes greeting customers as they enter and selecting and placing flowers on each table. She chose yellow and red flowers – one of each color, in a white vase, at each table – but not because they match the company’s corporate colors. Yellow, she said, is to support members of the U.S. military. Hubert Atkins, one of her five brothers, served with the Army during the Korean War in the 1950s. 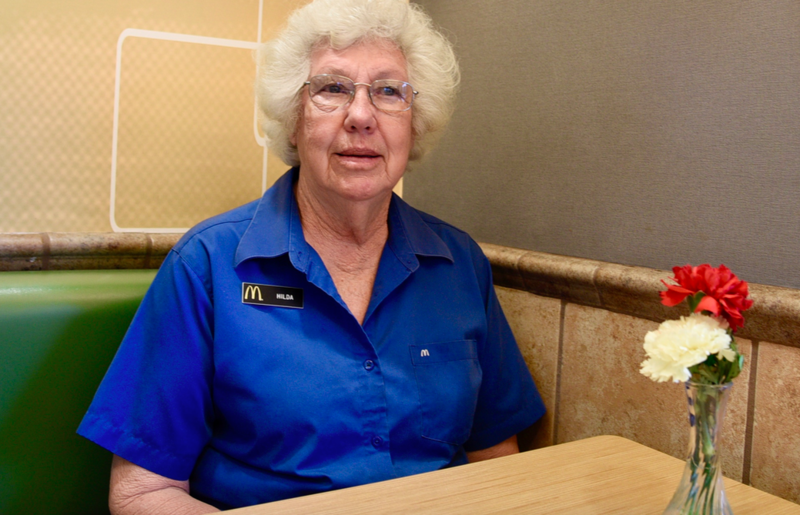 When she’s not working her 6:15 a.m. to 1 p.m. shift at McDonald’s, Coleman said she remains active by mowing her lawn, weed-eating and painting. She also helps her son split wood and attends church each Sunday. In the meantime, Coleman said she has no plans to change her routine. Editor’s note: This article and accompanying photos were originally published in the April 12 edition of the Northwest Observer. It is being published here, with the author’s permission, in order to give appropriate professional credit to the author and photographer.